This was such a great experience. 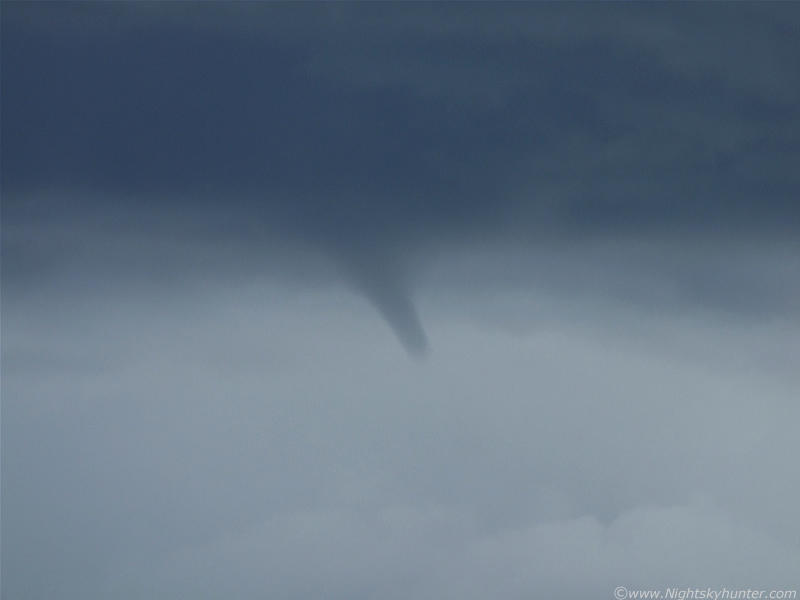 The funnel was rotating like crazy, was extremely well defined, and seemed to go on and on for a long time. We where perhaps less than half a mile distance from it. This was exactly what I was after so I began clicking away while my hands trembled slightly with excitement. 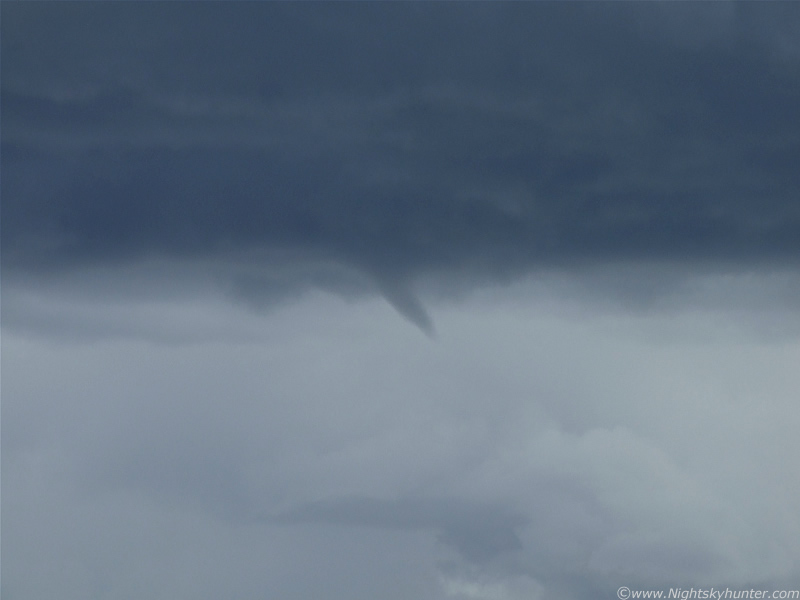 The funnel was much larger than it seems in these images. I needed a steady hand so I walked around to the driver's side of the car, while being mindful of passing cars, and used the roof to support my arms for the rest of these images. Luckily I managed to avoid getting the aerial in the frame. 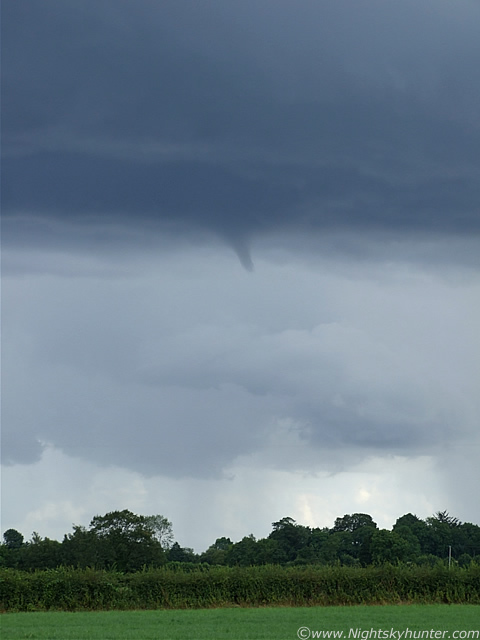 I'm sure this funnel was seen from a wide area, especially when hanging from such a high storm base. Passing cars slowed down and wondered what was going on when they saw me leaning across the roof with the camera. I seen their gaze following the camera, and into the sky, then to the funnel. Not only was the funnel rotating but so was that chunky base as well. I have a series of images just like the above taken with the zoom lens and when I flicked between them I could see everything in the frame rotating which was really cool. Would make a good animated GIF. At this point I was talking to it, willing it to go down further. At one stage I had that thrilling thought go through my head that this might touch down and become a tornado (or landspout as some would call it) and I remember thinking that this was the moment in time I had fantasized about many times, and if it happened now would I be ready for it?. I never got to find out how I would cope with the pressure test because the funnel seemed to prefer the height it was at and just spun away showing off, it almost felt like it appeared just for me which sounds silly. My goal today when I woke up was to catch a good funnel cloud, and now I had been rewarded, the suddeness of the event taking place threw me off a bit. I knew at this moment in time there where people at the Marina watching this over the Lough in amazement. If the funnel had dropped lower, or the base was lower, then this could have been a waterspout, but it looked too elevated to have produced a disturbance at the surface. 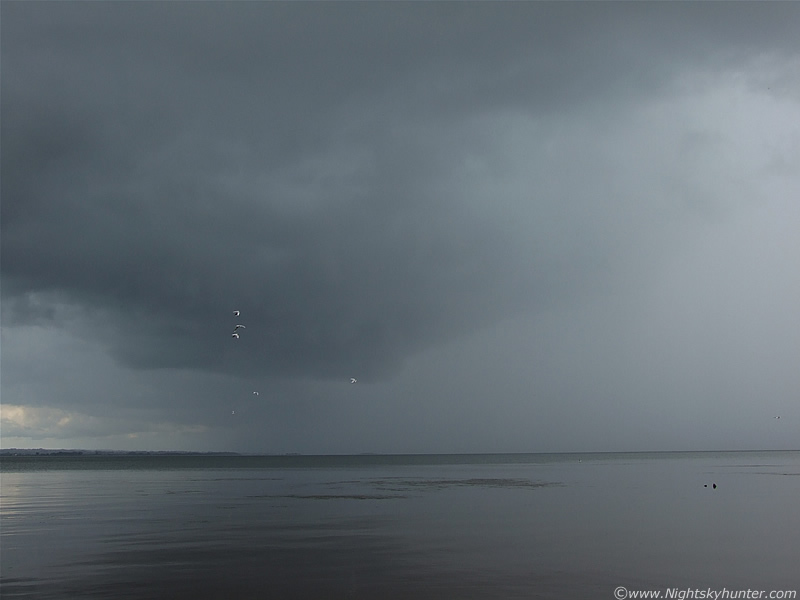 Wide shot showing the updraught base, funnel cloud, and storm with precip to the R. The funnel seemed to hang around forever but my eyes never once let it out of sight. 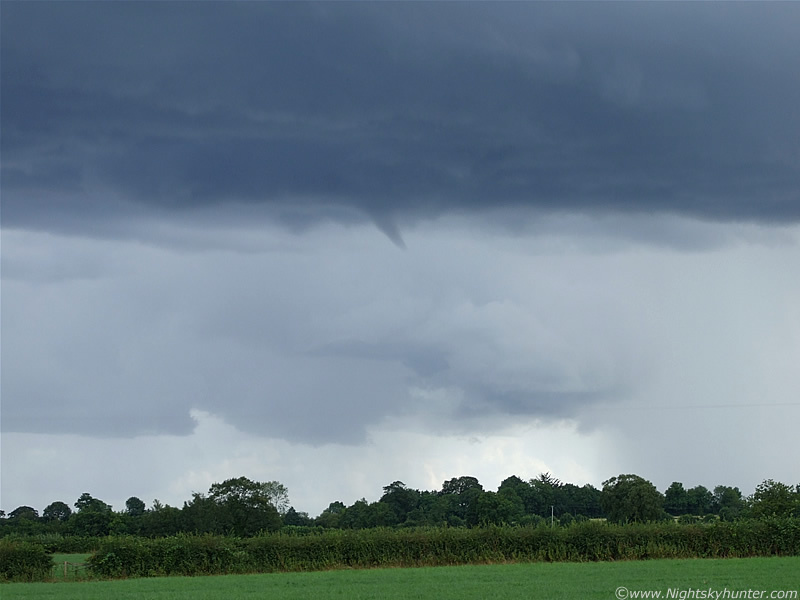 When a funnel appears one never knows for sure if it will hang around for long, many of them are short lived and require quick reactions and experienced camera skills to capture. 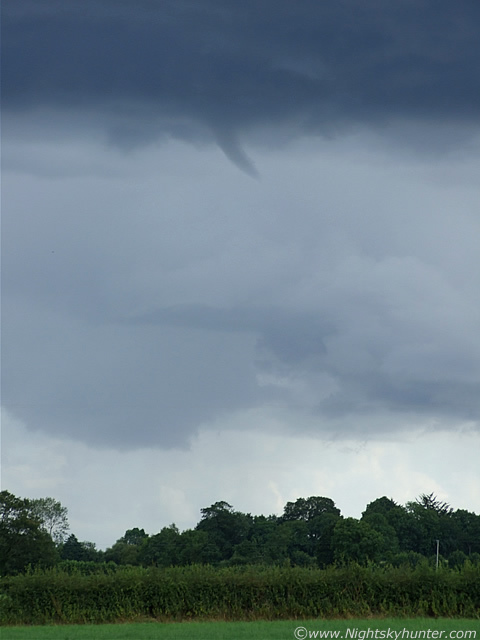 The more serious funnels tend to stay for much longer, like this one. Looking at these images and thinking back to that day has got me buzzing as I write this. 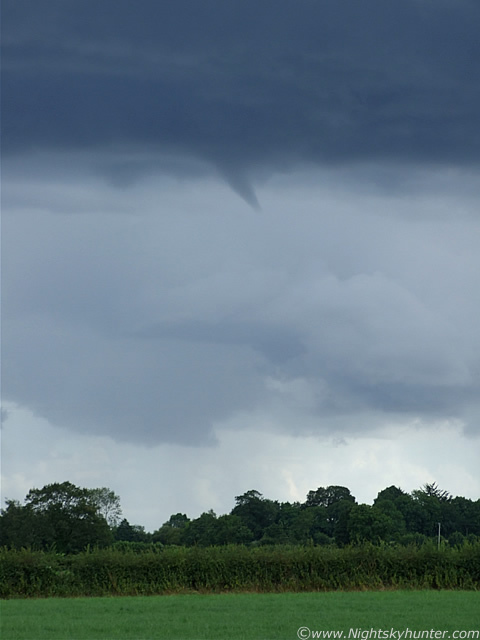 This was the best funnel cloud I have seen this season to date, in fact, it's the eighth one I have seen since my first sighting of the season in May. For some reason July and August always seem to be good months to see them in this country, although you can get them at any time of the year, however the Summer months produce the greatest number of reports. 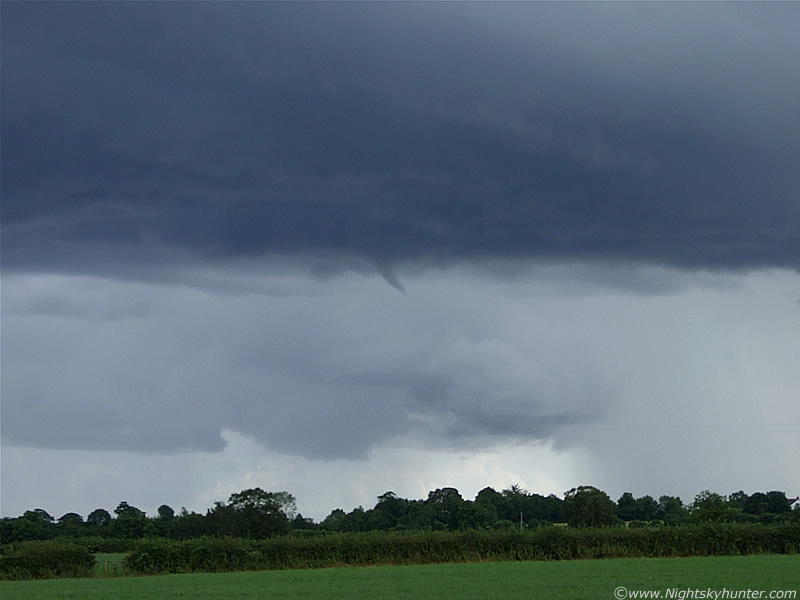 The funnel was now very dark and solid in profile. I recall thinking at the time that perhaps a breeze over the Lough had created a convergence zone which produced this vortex. Coastal areas can be great places to catch funnels and tornadoes because the Sea breeze can travel a fair distance inland from the Atlantic and interact with the inland winds/flow and create a convergence zone. 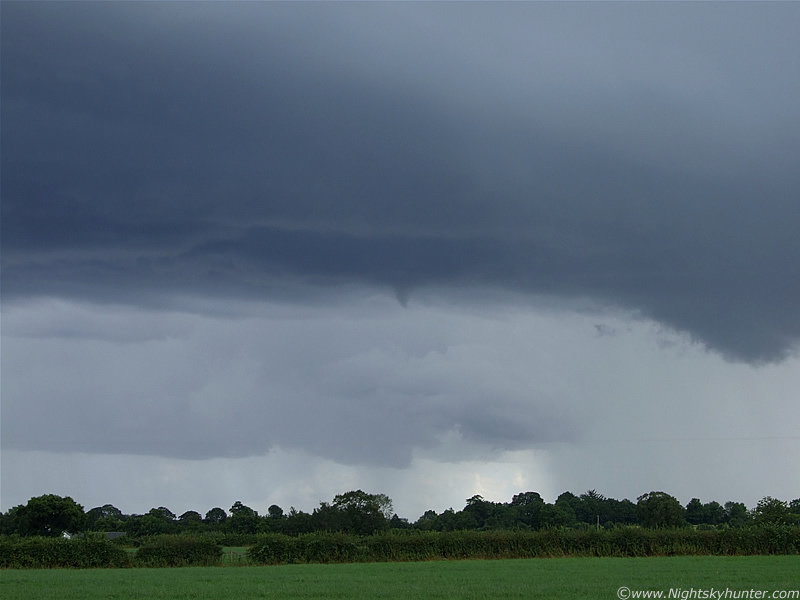 With Lough Neagh being so large with a micro climate of its own I was convinced that it did indeed produce an enhanced area of convergence which produced this funnel. 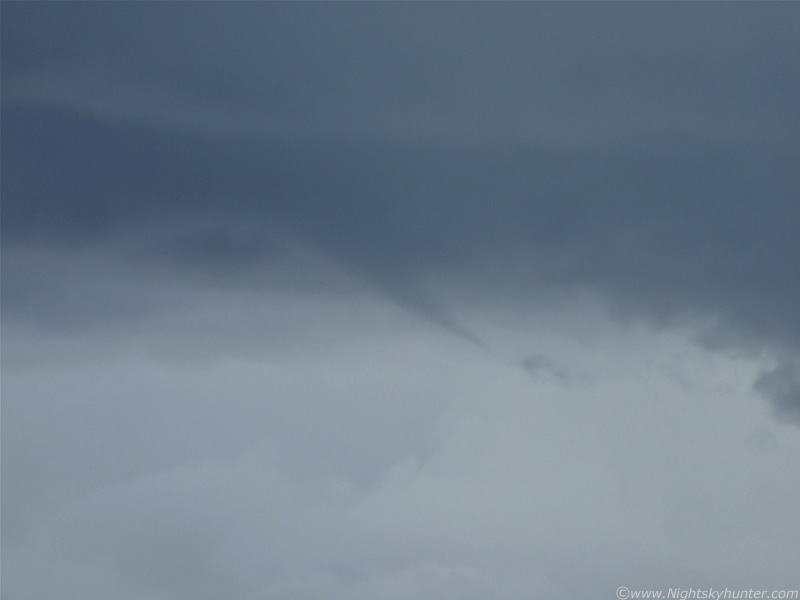 The funnel was fairly large when the above image was taken. After a thrilling period of watching it began to lift back up again and the show was almost over. It turned slender, became tilted into a horizontal position by the updraught, then roped out. The slender tip of it's snout seemed to flicker like a tail. That little curl of cloud below was part of the condensation tube which detached during the rope out but continued to spin on its own. Then it was gone. It had been visible from 16.30 - 16.45 BST, a full 15 min's. 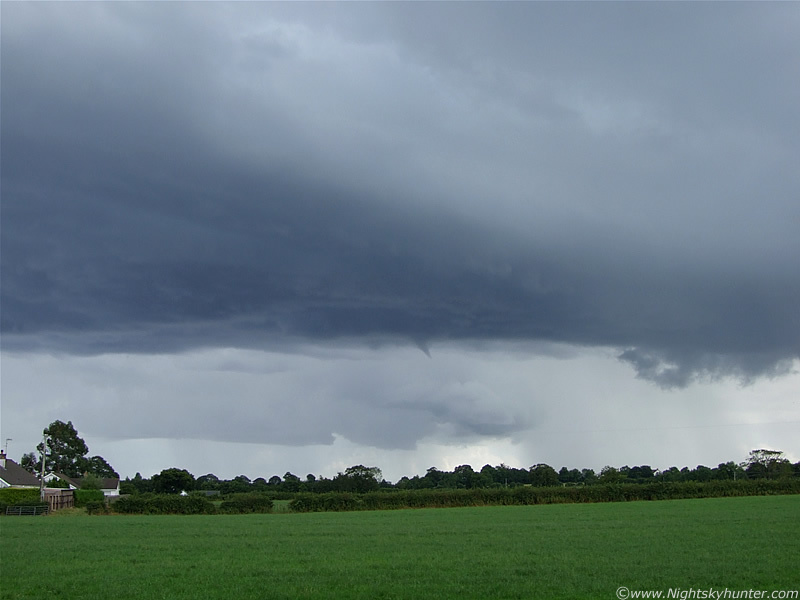 I later learned that other large funnels had been captured over Lisburn around this time with Greg Loyd catching two funnels in quick succession over Lisburn. There sure was alot of activity over N. Ireland this day. It goes to show that the potential was present for tornadoes. 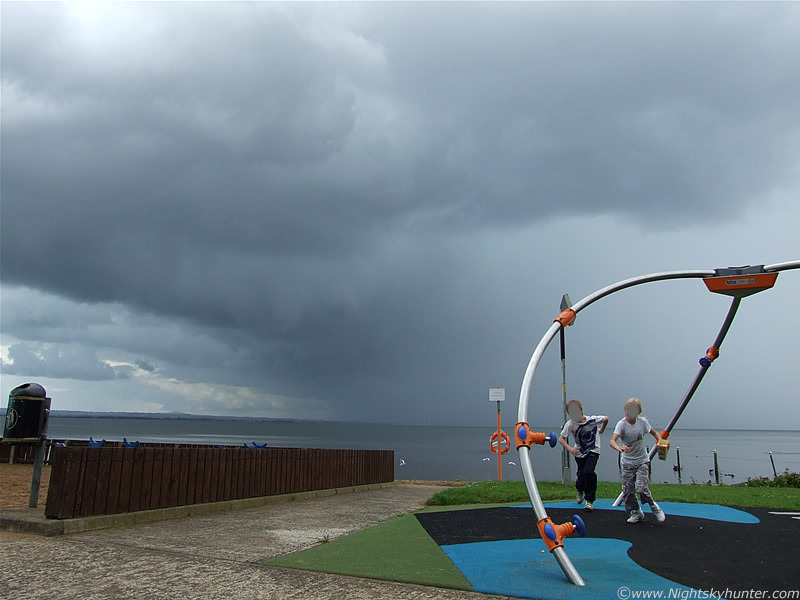 We drive on over to the Marina itself and the storm was already visible over the Lough and slowly approaching the car park. 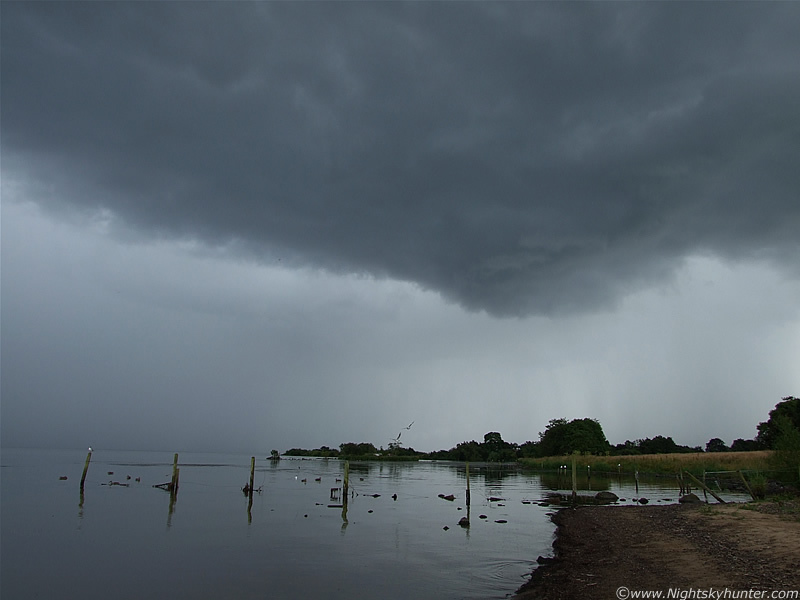 The L side was over the water and the R, out of frame, was over the shore and land with rain intensifying. 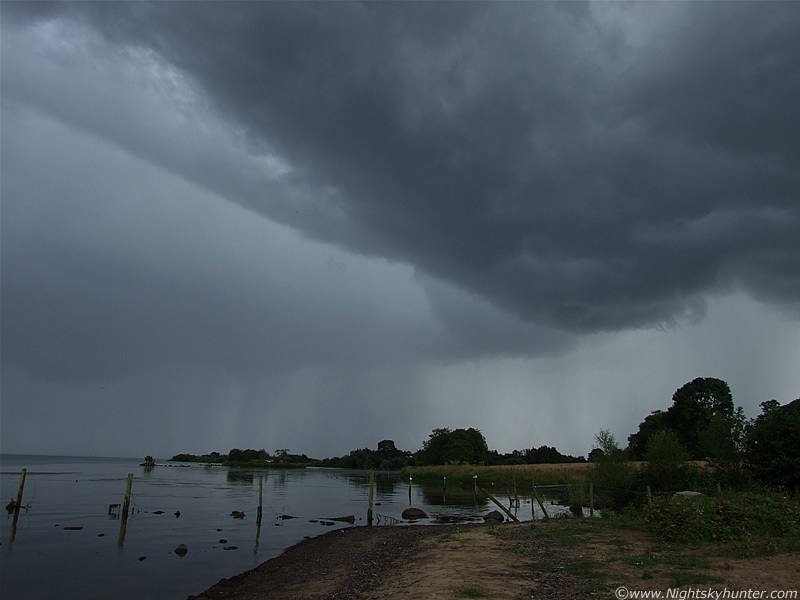 The gust front created a bowing wake across the water as the downdraught and precip forced itself forward along the surface. Lightning could be seen flickering inside the rain, most of which was hidden again, but I could make out white i-c bolts. 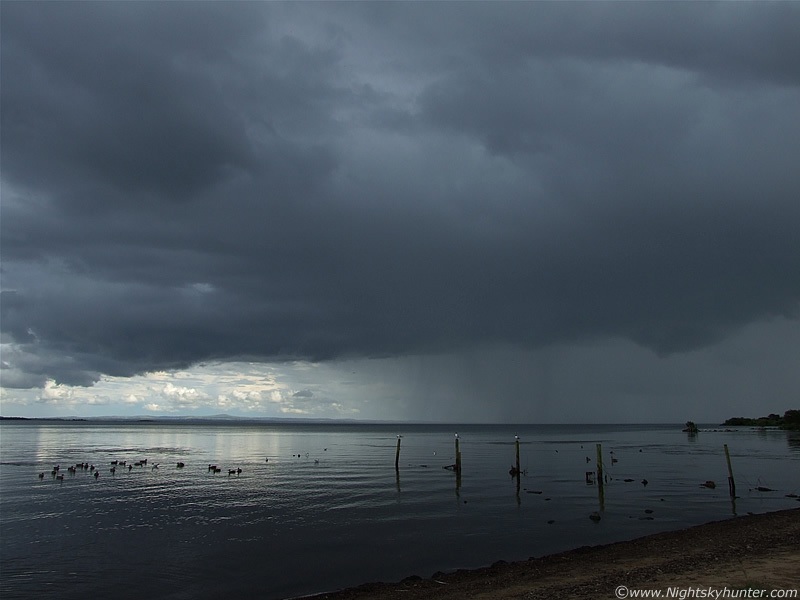 It was a surreal scene hearing that very loud and angry thunder blasting across the Lough while Ducks and Gulls did their thing. I was set-up on the sandy shore with camera on tripod taking stills and video. Part of the gust front was directly over me now with the precip getting heavier. One particularly loud rumble scared some of the Children, one went into an hysterical fit of screaming which you can hear on the video clip. There where people on the shore watching the storm, some I think were more interested in what I was doing so several families walked up close behind me looking at the camera with curiosity. I heard one little girl asking her Mother who I was, to which her Mother said ''that's the weather man'' lol, I've never been called that before!. The precip curtain became extremely well defined and the first spits of rain falling from the flank of the storm where falling with heavy consistency on me and the camera. I mentioned on my previous storm report how I'm actually quite scared of lightning, however now I have seen so many storms this season that I'm actually getting used to them. I wasn't bothered at all as close range lightning flashed and thunder boomed with me in the danger zone, that's not a good thing, complacency can lead to danger so I would need to be careful in the future. There where white flashes to the L and R within that precip curtain. The thunder was nasty though and triggered that primitive fear built into us all which alerts us to danger and produces the adrenalin dump and the 'fight or flight' syndrome. Some people freeze, others run for cover, I stayed from choice. I was pretty much on my own at this point. Looking E at the other side of the gust front/storm. You can make out the E shore of the Lough which no doubt provided a better view of the lightning. Storm moving R to L and at the same time passing the zenith. Eventually the rain became too heavy to use the camera so I retreated to the safety of the car because the lightning zone was straight over this area. Amazingly a group of Children decided to go out and play among the rain and I couldn't believe what I was seeing. Where are the parents?, they know there's a bad storm outside and yet they let them go out in it. I think this is the height of stupidity and an example of how inept some parents are today. These Children where in the lightning risk area and stayed under it for a long time. They didn't know any better of course but their parents should. When the rain became very heavy one of them actually ran over and stood under the biggest and only tree in the area, we actually told him to get away from it which was a wise decision. Every time there's a storm here the same thing happens, fortunately no one got hit and the day ended on a happy note. This image was taken leaning out the side window. I had to paint over the faces of the Children because I didn't want to get in trouble. I was taking video of this same scene above and just hoped a c-g would come down in the background so I could extract the still image, it would have made a great lightning hazard educational image. I did record the thunder though. Here's a video clip showing various scenes. The first half is the drive up showing the base of those multicell storms. There's a brief clip of the funnel however it was only taken near the end stage before it roped out, it was much more spectacular before then and I wanted to get still images so had to sacrifice the video of that. After that is some of the thunder over the Lough which was MUCH louder in reality than it seems here thanks to the mediocre speakers on my camera. It looks cool though with the storm and ducks interacting together. I was very happy with the way this day turned out and was satisfied in the extreme by the time I got home around 18.00. Two storms and a funnel is pretty good going in the one day which brings this season's count to 18 thunderstorms and 8 funnel clouds. I'm sure there will be more to come too, and when they do, I plan on being there!. Thanks very much for reading.